The end of football? Why concussion lawsuits won't bring down the game. 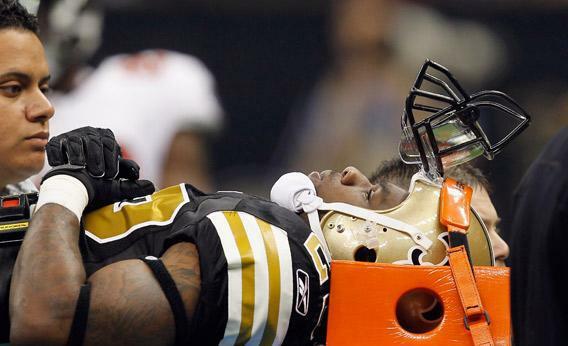 Why concussion lawsuits won’t bring an end to football. Tracy Porter of the New Orleans Saints is carried off the field after being injured Nov. 6, 2011. As a young athlete, Dustin Fink suffered 11 concussions while skiing and playing football and baseball. Three years ago, he began to suspect that the knocks had seriously damaged his brain. He kept getting headaches, had trouble sleeping, and started feeling depressed and emotionally unbalanced. For one awful moment, he says, he was on the verge of suicide. Fink, the proprietor of the Concussion Blog, couldn’t help thinking that his symptoms were consistent with chronic traumatic encephalopathy, or CTE, the degenerative brain disease that has recently been linked with the suicides of several former NFL players. Fink felt this way because he’s an athletic trainer. For years, he instructed high-school football players who’d suffered concussions to sit out for 15 minutes or so, then sent them right back onto the field—a protocol that was considered sound practice until about seven years ago. Now he can’t help but wonder whether he endangered the lives of the students he was supposed to protect. No one knows whether the suicide last month of former San Diego Chargers star Junior Seau had anything to do with the concussions he suffered throughout his career. Seau’s high-profile death, however, has lent new urgency to the question of just how dangerous football is for those who play it. It has also made a relatively new and hypothetical question a little less hypothetical: Could football’s days be numbered? Writing for Grantland, economists Tyler Cowen and Kevin Grier recently imagined a “doomsday scenario” in which the emerging research on football-related brain injuries leads to the demise of the sport as we know it. The chain reaction would start, they reasoned, with liability suits brought by former players against colleges and high schools, which may consider dropping the sport rather than risk more multimillion-dollar judgments. Those institutions that were reluctant to give up football would be forced to drop the sport by insurance companies, which would hike premiums or even refuse to insure schools against suits arising from on-field injuries. But that pathway to football’s demise seems both unlikely and undesirable. To understand why, you first need to grasp how insurance works in the football world. High schools, colleges, and other amateur organizations that sponsor football teams typically carry at least two types of relevant insurance policies. The kind of policy they take out specifically for sports is supplemental medical insurance. If brain injuries were like torn ACLs—immediate, painful, and expensive to treat in the short term—then insurance companies might consider hiking those premiums for schools that play football. But they aren’t. The brain lacks pain receptors, so even a brutal concussion usually registers only as a sort of foggy dullness in the mind. And the damage adds up over time, so that some of the worst symptoms—memory and hearing loss, depression, speech impediments, dementia—only reveal themselves years after a player’s career is over. By then, medical insurance is beside the point. There’s also liability insurance, which covers all sorts of serious injuries that happen on campus or in the course of school-sponsored events. This isn’t usually sports-specific—it also covers the kid who falls off the monkey bars or the parent who slips on an icy sidewalk. And the number of immediate debilitating brain injuries attributable to football remains small compared with the catastrophic injuries that result from, say, school bus crashes. According to an annual study by researchers at the University of North Carolina, a total of 13 catastrophic brain injuries were reported in 2011 out of 4.2 million people who competed in football nationwide. But, again, that doesn’t count all the former players whose symptoms of brain damage crop up later in life. That’s where the lawsuits come in. There are two major categories of football-related lawsuits winding their way through the courts: those faced by the NFL and those faced by public high schools. The NFL, for its part, is fielding concussion-related lawsuits from a total of 1,500 former players. The latest suit, brought by more than 100 players, cites the mounting evidence linking football concussions to CTE. The links between head trauma, CTE, and symptoms like depression aren’t yet rock solid, as my colleague Daniel Engber explains, but a series of studies has found that football players are far more likely than the general population to suffer memory-related diseases. A Boston University research lab has also detected signs of CTE in the brains of 14 of the 15 former NFL players they’ve examined. Proving that football hits can lead to brain damage isn’t necessarily enough to win a lawsuit. Everyone knows football is a risky sport, and a player will likely suffer concussions over the course of a long career. In order to win a judgment, you have to prove negligence of some sort. As a consequence, the suits against the NFL allege that the league deliberately downplayed the medical risks associated with concussions. As with the NFL, there’s an assumption that amateur players understand that football carries serious injury risks. Players often sign waivers indemnifying the school or club in case of serious injuries arising from normal football activities. A major difference between the lawsuits against schools and those against the NFL is that no one is claiming schools hid evidence of the long-term effects of concussions. Instead, lawsuits at the lower levels have focused on proving negligence on the part of coaches or administrators for not implementing safety measures that should have been obvious—hiring athletic trainers, for instance, or holding players out of action after they were concussed. In many cases, even showing that coaches were negligent may not be enough. In Illinois, for example, state law makes public entities such as school boards, along with their employees, immune from liability for “ordinary negligence.” To win a judgment, the plaintiffs have to prove “willful and wanton” conduct. Still, most lawyers say football-related brain-injury cases remain tough to win. Randall Scarlett, a San Francisco-based lawyer specializing in brain-injury suits, says more and more parents of football players are approaching him. Scarlett, though, has yet to accept a case, because he believes the “assumption of risk” defense—the argument that players knew what they were getting into when they signed up for the sport—makes legal victory unlikely. Until states and scholastic athletics associations adopt tough, specific policies designed to limit concussions, it’s awfully hard to show that individual schools or coaches have violated them. Fink, the athletic trainer, has become one of the leading advocates for tougher rules. He’s frustrated that athletic associations have so far made only minor changes, like altering the rules governing how teams can block during onside kicks. If amateur football is a sinking ship, these sorts of changes barely count as rearranging the deck chairs. But Fink is understandably ambivalent about multimillion-dollar lawsuits serving as the main impetus for change. He says he’d never consider suing over his own injuries, as traumatic as they are, because authorities didn’t know any better at the time he sustained them. He says he’d hope for the same understanding from the players that he treated, should they end up with symptoms like his. The answer to that question should come not from the courts but from high-school athletic conferences, scholastic sports associations, and the NCAA. As the research rolls in, they need to take a hard look at the aspects of the game that inflict the most damage and implement rule changes accordingly. If football ends someday, it should only be because the powers that oversee the sport have tried everything to make it safe and determined that it can’t be done—not because lawsuits have spooked schools into giving up.